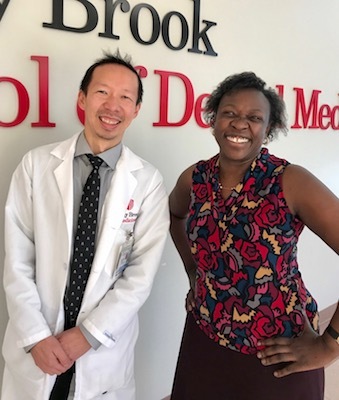 November 2018 - In support of National TMJ Awareness Month, Stony Brook School of Dental Medicine faculty members, Nora Odingo, DMD, MPH, and David Lam, MD, DDS, PhD, answered frequently asked questions about TMJ Disorders. According to the National Institute of Dental and Craniofacial Research, it is estimated that over 10 million Americans are affected. Dr. Odingo serves as Assistant Professor and Predoctoral Director of the Division of Oral & Maxillofacial Pathology. Dr. Lam serves as Professor and Chairman of the Department of Oral & Maxillofacial Surgery. 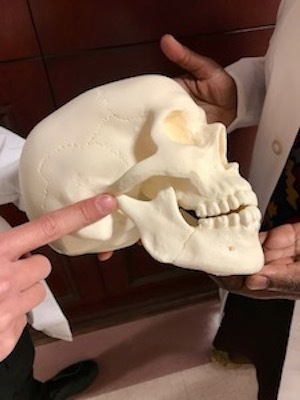 The temporomandibular joint (TMJ) is a complex articulation of the movable lower jaw (mandible) and the base of the skull (temporal bone) that make it possible to open and close your mouth. Located on each side of your head, your TMJ is a ball and socket joint, with an intervening disc, that works together along with supporting jaw muscles and ligaments to help you to chew, speak, and swallow. Temporomandibular disorders (TMD) are a common group of related pain conditions involving the TMJ, jaw muscles and associated structures. Possible causes may include arthritis, dislocation, injury, tooth or jaw alignment, stress, and tooth grinding. Diagnosis is essential before treatment. Most TMDs are self-limiting, so a conservative approach is best including: eating softer foods, avoiding repetitive function (such as gum chewing, biting nails, ice-chip chewing), modifying pain with heat packs, practicing relaxation techniques to minimize jaw tension such as meditation or biofeedback. If necessary, your dentist may recommend exercises to strengthen your jaw muscles, medications (anti-inflammatories, analgesics, muscle relaxants, anti-anxiety drugs) or a night guard or bite plate to decrease clenching or grinding. Very rarely is a surgical intervention (such as arthrocentesis, arthroscopy) required. Can I make an appointment at Stony Brook for help with TMJ Disorder? Yes, to find out how to become a patient of Stony Brook School of Dental Medicine’s Dental Care Center, or to schedule an appointment, please call (631) 632-8989 between the hours of 8:30 am and 5:00 pm, Monday through Friday.